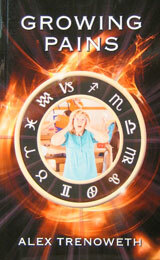 Alex’s eagerly awaited book on the astrology of growth and development is due for release later on 13 July 2013. “Growing Pains” is based on some of her research for the MA in Cultural and Astronomy and Astrology course from Bath Spa University as well as her experiences in teaching adolescents. Alex’s eagerly awaited book on the astrology of growth and development is due for release later on 13 July 2013. “Growing Pains” is based on some of her research for the MA in Cultural and Astronomy and Astrology course from Bath Spa University as well as her experiences in teaching adolescents. The book provides an interpretation for Jupiter and Saturn in each of the zodiacal signs as well as a celebrity example for each. If you’ve wondered about how you can use astrology to capitalise on opportunities for success and development, then this book is for you! Alex Trenoweth is an astrologer, writer, musician and high school teacher. Born in Port Huron Michigan, she now resides in London England. Alex first became interested in astrology when she discovered there was so much knowledge beyond star sign columns. Be the first to review “Growing Pains – Alex Trenoweth” Click here to cancel reply. Самая актуальная информация iq login здесь.